It’s the Tough Trucks Challenge in Wales and Jim Marsden, Chris Morris, Paul Church and John Grisly are fighting to retain the title they had won the previous year. Everything was going well with the team leading after Day 1. Disaster struck the following day. While winching through a deep Welsh bog the mainshaft in Jim’s 8274 Winch snaps. This breakage caused the guys to drop to 3rd place overall. When Jim got home he set about designing a new stronger shaft. A few weeks later he had the first ten Gigglepin hardened Mainshafts, he kept two and sold the other eight. Requests for more shafts started to arrive, and before long Gigglepin was producing large numbers of the Mainshaft kits and developing other winch up-grades. Over the years the Mainshaft kit has changed very little from the original designed by Jim, and still is the first upgrade that should be made to any Warn 8274 to be used in Extreme environments or Competitions. The Gigglepin Mainshaft kit is designed to eliminate 6 problems found in the standard Warn 8274 winch, and is the same Mainshaft that is used in our Gigglepin GP80 Series Winches. 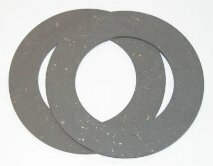 Material grade has been increased from EN24 to EN36 to prevent breakage. Gears are now shimmed to support them, eliminating tooth failure. Redesigned, up-rated, toughened cam gear for perfect cam engagement and improved braking. Deletion of the retaining plate groove giving maximum shaft strength. The circlip at the end of the shaft has been replaced with a cap and bolt configuration, ensuring correct brake function at all times. Bearing surfaces have been manufactured to higher tolerances, giving unsurpassed reliability. This shaft kit has been developed to give the serious Warn 8274 user the strength and reliability required in today's competition and extreme winch situations. The standard 8274 brake is a very clever unit that utilises cam gears that are load sensitive. Due to the brake being external it is perfect for extreme winch situations and allows the use of synthetic ropes without fear of them being heat damaged. The standard 8274 brake shoes are very poor quality and if used in harsh environments disintegrate causing loss of breaking performance. The Gigglepin up-rated shoes are designed to be used with or without lubrication. They are larger than the original version and more flexible, making them the ultimate upgrade for your 8274 brake. Top tip: When you finish using your 8274 winch or Gigglepin GP80 series winch and plan to leave it standing for any length of time. Always leave the winch cable loose so that the brake is in the “Off” position. When in “Off” position, you should be able to spin the centre brake ratchet freely. If using Gigglepin brake shoes, give them a squirt of WD40. This will help to keep the shoes and brake from sticking allowing them to be in perfect working condition the next time you hit the trail. The GP billet brake assembly is precision machined from high grade materials & is used on our GP80 series Winches and can be used as an upgrade replacement for 8274. We have designed a new inner ratchet disc, reducing the number of teeth to 15 rather than 18, this reduces the risk of the brake pawl semi engaging which can cause considerable damage or disengagement. The inner & outer discs provide positive engagement with the woodruff keys & large cam gear on the winch mainshaft. To enhance the brake assembly, they are finished in a high quality zinc, long lasting, professional finish. Any mechanical product is only as good as the Gears that drive them. Gigglepin Gears are made from the highest grade EN36 material that is then case hardened. 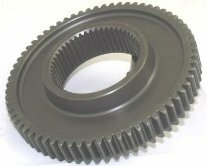 Gigglepin Gears are made to withstand years of abuse and undergo the same heat treating and finishing processes as gears found in racing gearboxes costing 10 times the price of a Gigglepin winch. It this that gives Gigglepin winches the reliability that has become legendary in the toughest events around the world. The Gigglepin end plate is made from solid aluminium billet and has several advantages over the existing Warn unit. The Gigglepin end plate has multiple M12 mounting positions to allow for a variety of mounting opportunities or to fit brace bars or perhaps even as a mounting for a brake calliper for those feeling adventurous. It made to the usual Gigglepin high standards and yet far cheaper than the original Warn end plate. Comes supplied with Warn fibre drum bush (7610) and two mounting bolts.